Sacramento, CA: California took a step closer Monday to curbing the use of a pesticide linked to permanent brain harm, including ADHD, autism and IQ loss. Sixteen months after disgraced former EPA Administrator Scott Pruitt defied his own scientists and refused to ban the neurotoxic organophosphate chlorpyrifos, the California Department of Pesticide Regulation (DPR) has concluded their own study by largely agreeing with the EPA scientists: current uses of chlorpyrifos put children at risk from unsafe levels of exposure from residues on food, contaminated water, and pesticide drift up to half a mile. Now, children’s health advocates are pushing the department to follow the science with sound policy, and become the second state in the nation to ban it. Hawaii’s state legislature passed a statewide ban in May. 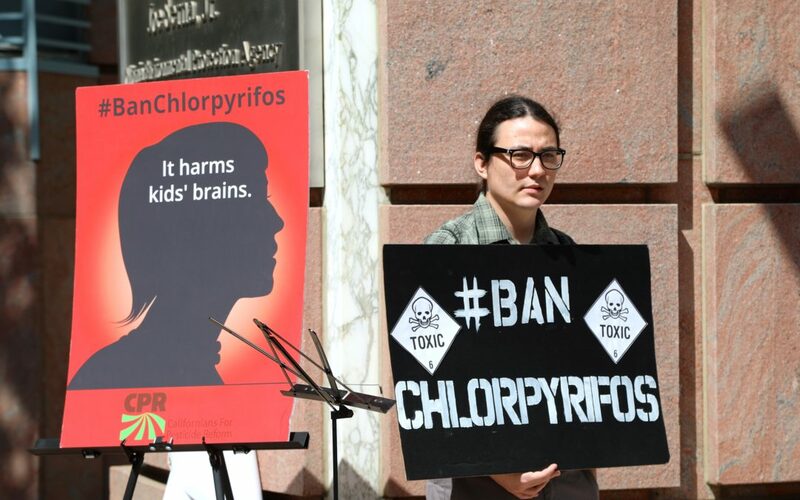 “We’re glad that the state has finally accepted the overwhelming consensus of federal and independent scientists who’ve studied chlorpyrifos for years and determined that it harms kids’ brains severely and irreversibly,” said Mark Weller, co-director of the statewide coalition Californians for Pesticide Reform.